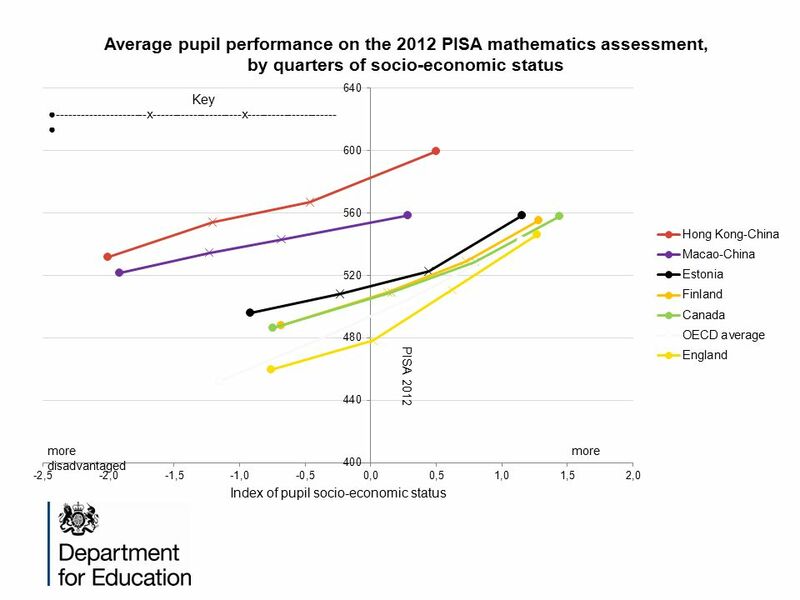 The Pupil Premium: Raising attainment and accelerating progress Alice Chicken Department for Education Redcar and Cleveland 4 July 2014. 2 Areas I plan to cover today 1. 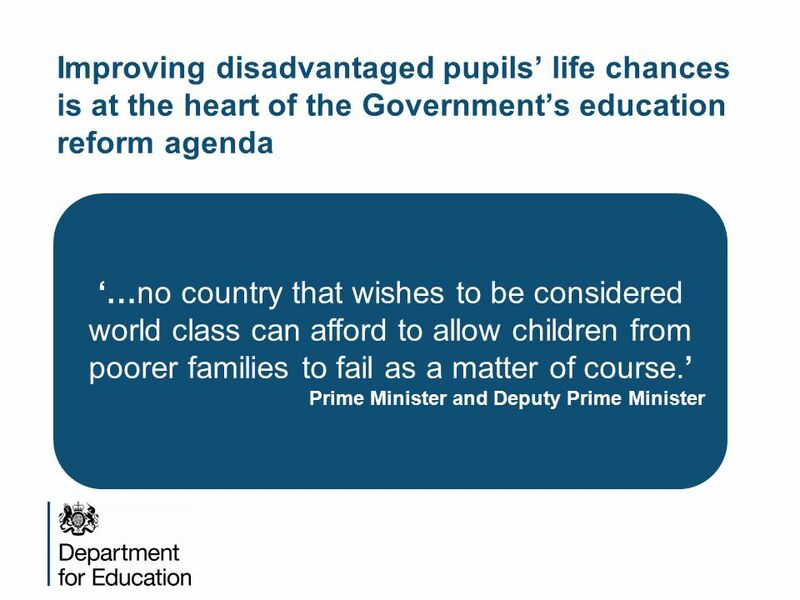 The context –The Government’s reform agenda –Why is the Pupil Premium needed? 2. 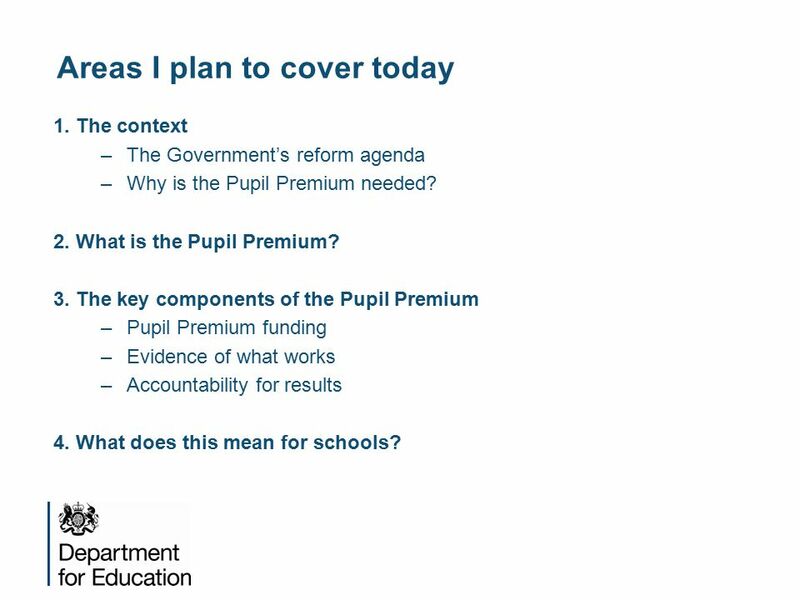 What is the Pupil Premium? 3. 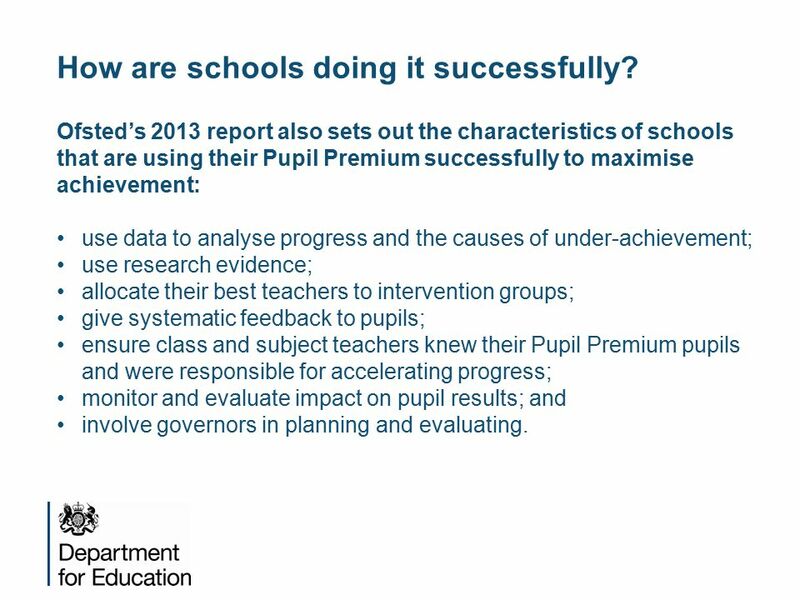 The key components of the Pupil Premium –Pupil Premium funding –Evidence of what works –Accountability for results 4. 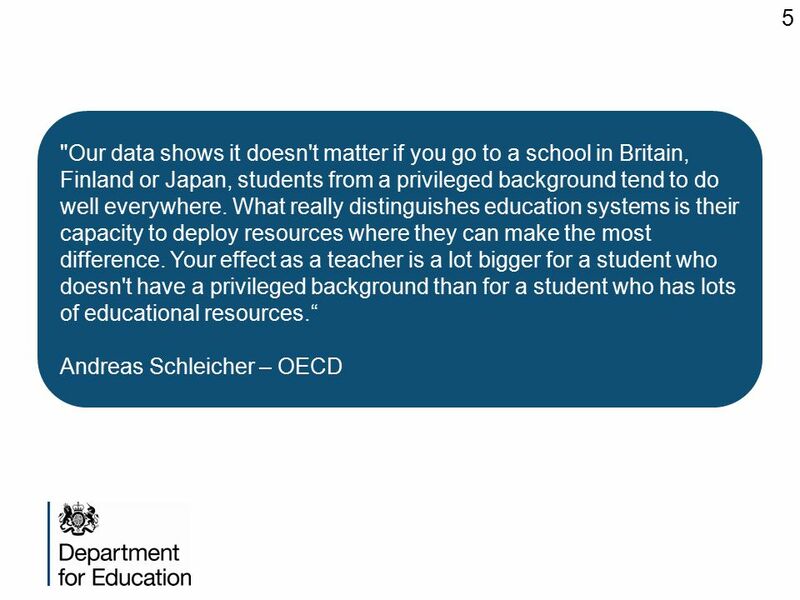 What does this mean for schools? 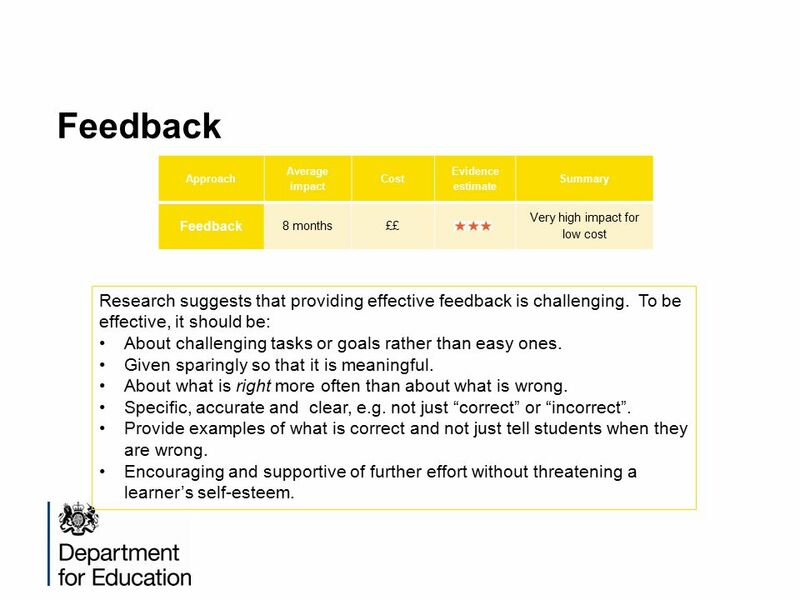 17 Feedback Approach Average impact Cost Evidence estimate Summary Feedback 8 months££ Very high impact for low cost Research suggests that providing effective feedback is challenging. To be effective, it should be: About challenging tasks or goals rather than easy ones. Given sparingly so that it is meaningful. About what is right more often than about what is wrong. Specific, accurate and clear, e.g. not just “correct” or “incorrect”. Provide examples of what is correct and not just tell students when they are wrong. Encouraging and supportive of further effort without threatening a learner’s self-esteem. 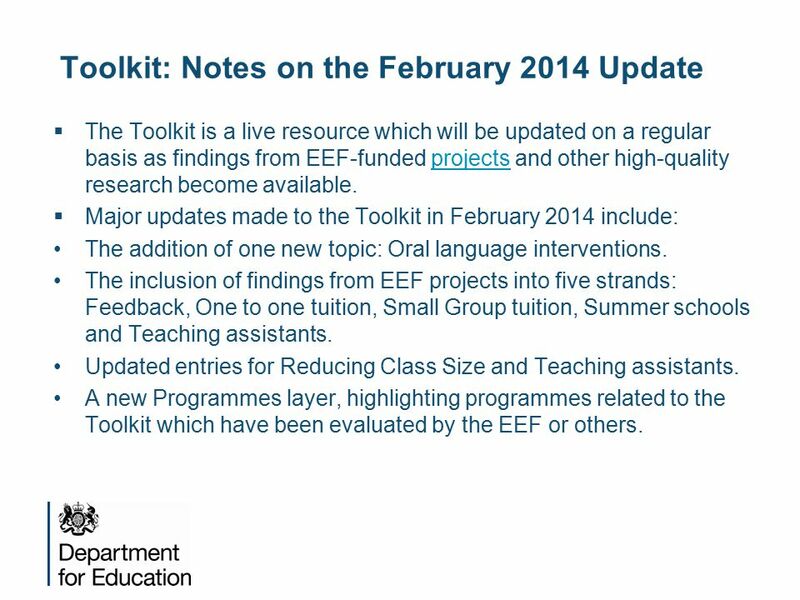 18 Toolkit: Notes on the February 2014 Update  The Toolkit is a live resource which will be updated on a regular basis as findings from EEF-funded projects and other high-quality research become available.projects  Major updates made to the Toolkit in February 2014 include: The addition of one new topic: Oral language interventions. 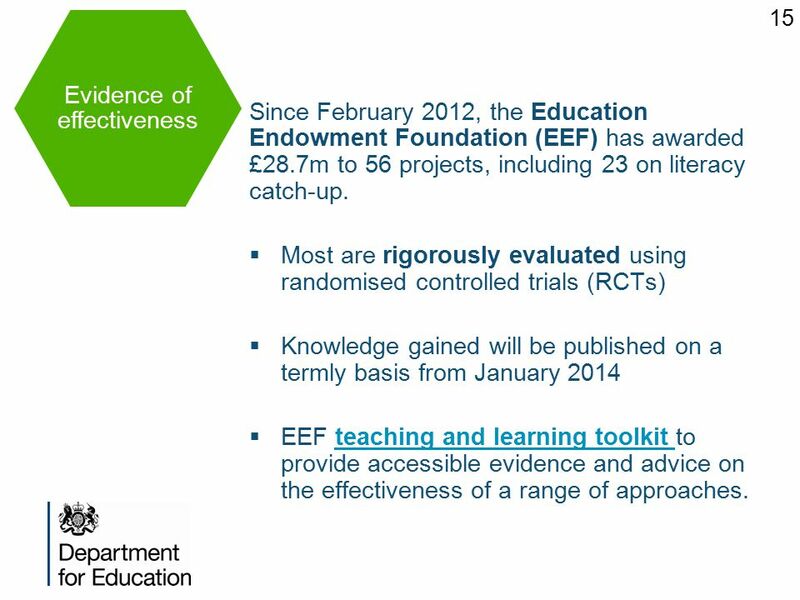 The inclusion of findings from EEF projects into five strands: Feedback, One to one tuition, Small Group tuition, Summer schools and Teaching assistants. Updated entries for Reducing Class Size and Teaching assistants. 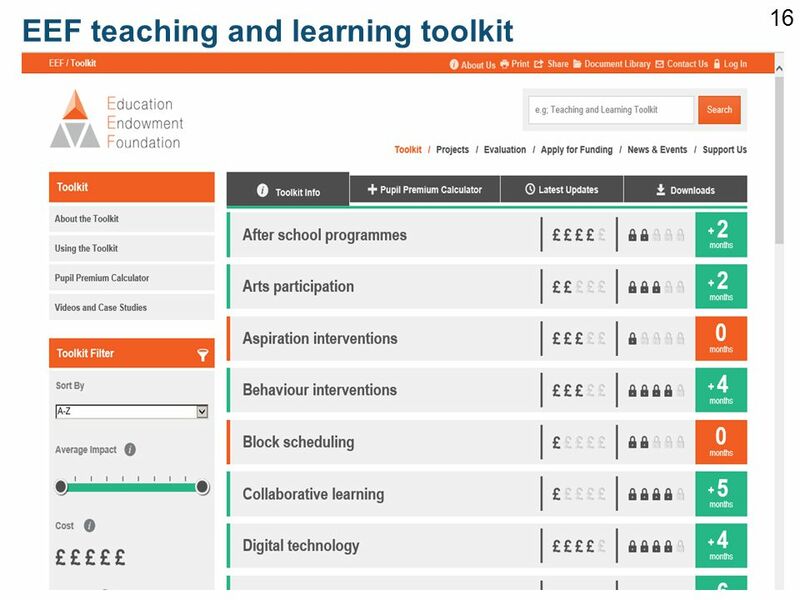 A new Programmes layer, highlighting programmes related to the Toolkit which have been evaluated by the EEF or others. 21 How are schools doing it successfully? 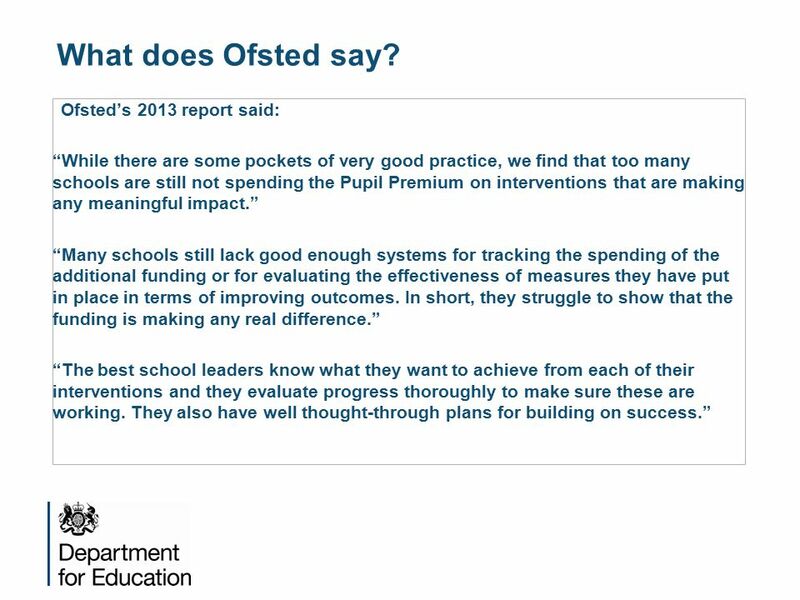 Ofsted’s 2013 report also sets out the characteristics of schools that are using their Pupil Premium successfully to maximise achievement: use data to analyse progress and the causes of under-achievement; use research evidence; allocate their best teachers to intervention groups; give systematic feedback to pupils; ensure class and subject teachers knew their Pupil Premium pupils and were responsible for accelerating progress; monitor and evaluate impact on pupil results; and involve governors in planning and evaluating. 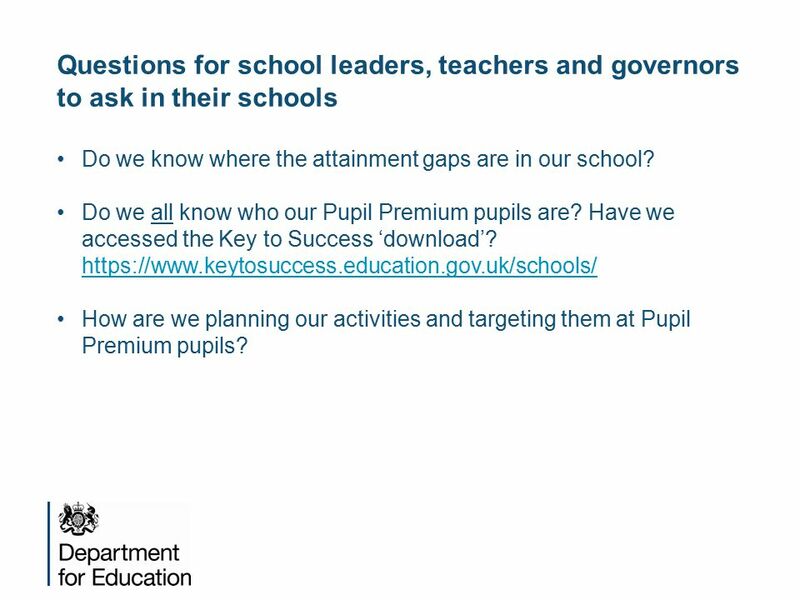 23 Questions for school leaders, teachers and governors to ask in their schools Do we know where the attainment gaps are in our school? 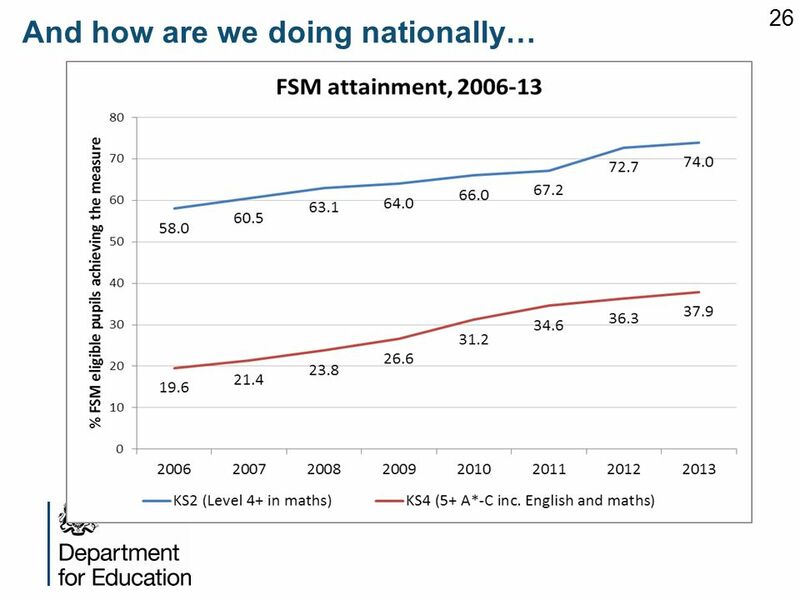 Do we all know who our Pupil Premium pupils are? Have we accessed the Key to Success ‘download’? 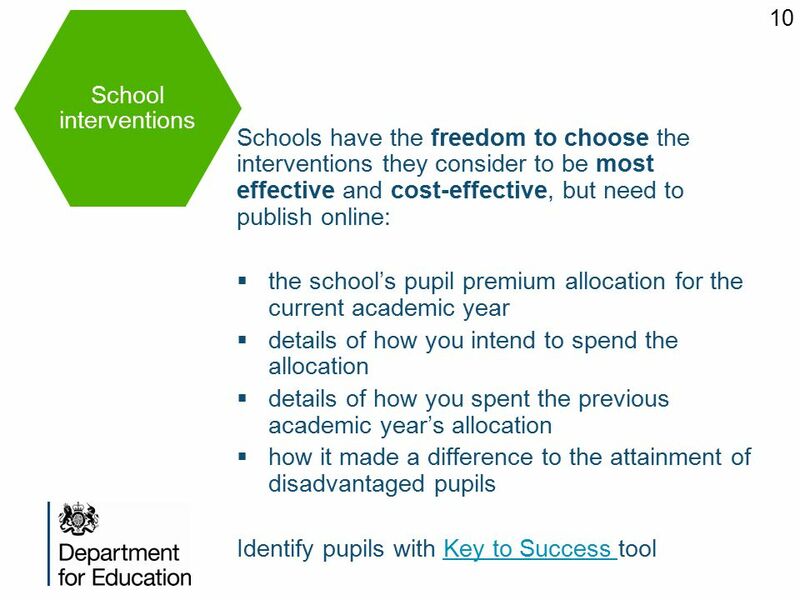 https://www.keytosuccess.education.gov.uk/schools/ https://www.keytosuccess.education.gov.uk/schools/ How are we planning our activities and targeting them at Pupil Premium pupils? 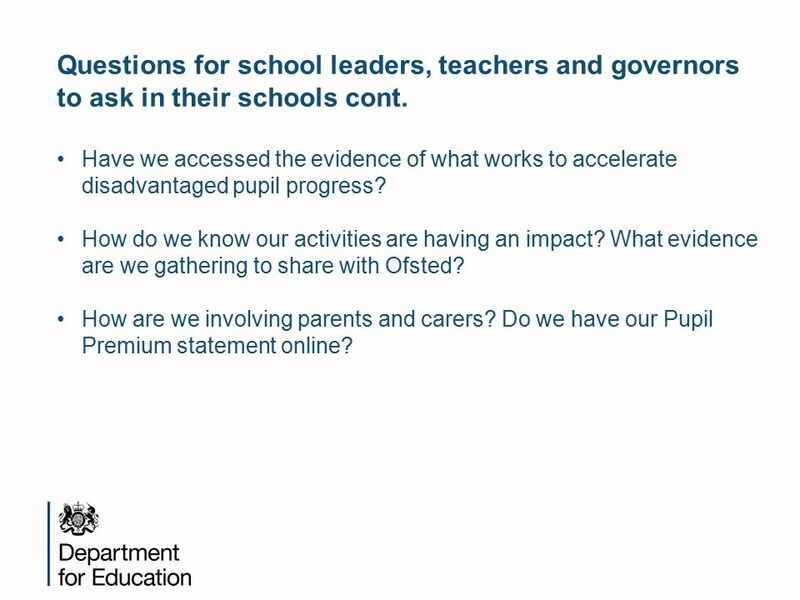 24 Questions for school leaders, teachers and governors to ask in their schools cont. 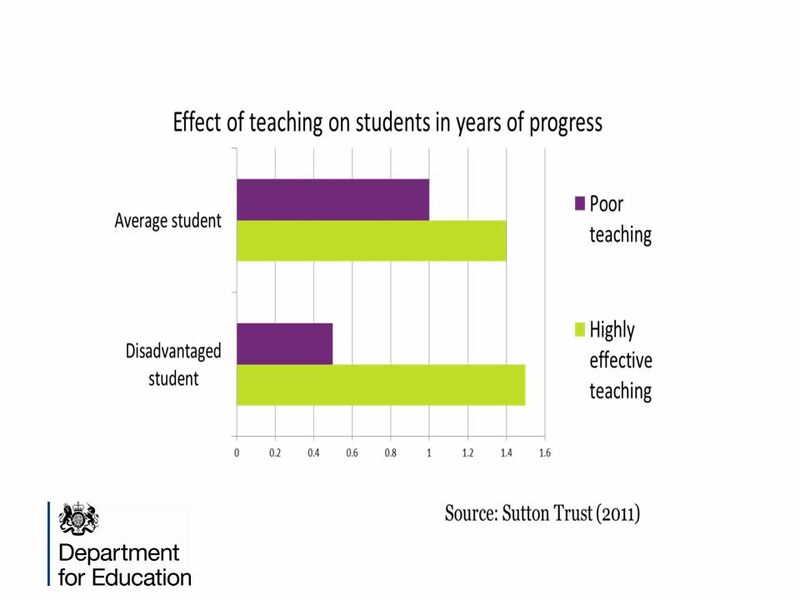 Have we accessed the evidence of what works to accelerate disadvantaged pupil progress? How do we know our activities are having an impact? 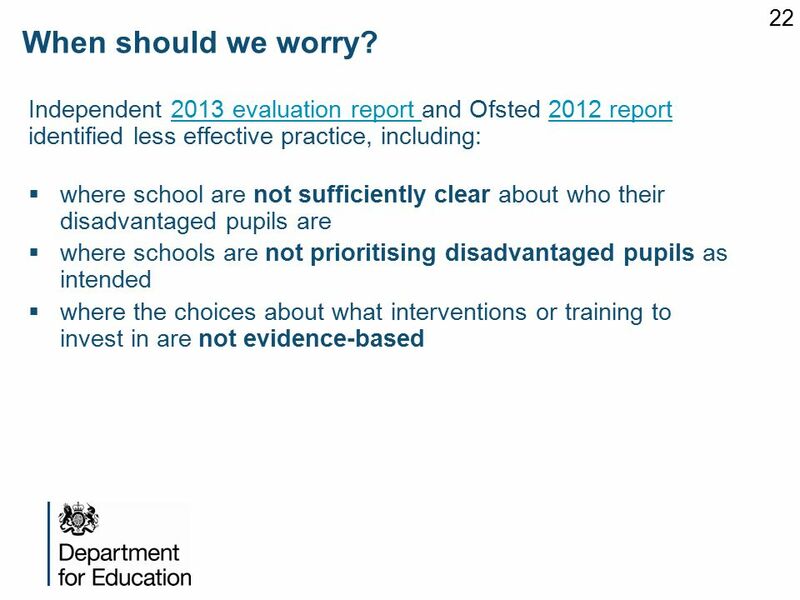 What evidence are we gathering to share with Ofsted? How are we involving parents and carers? 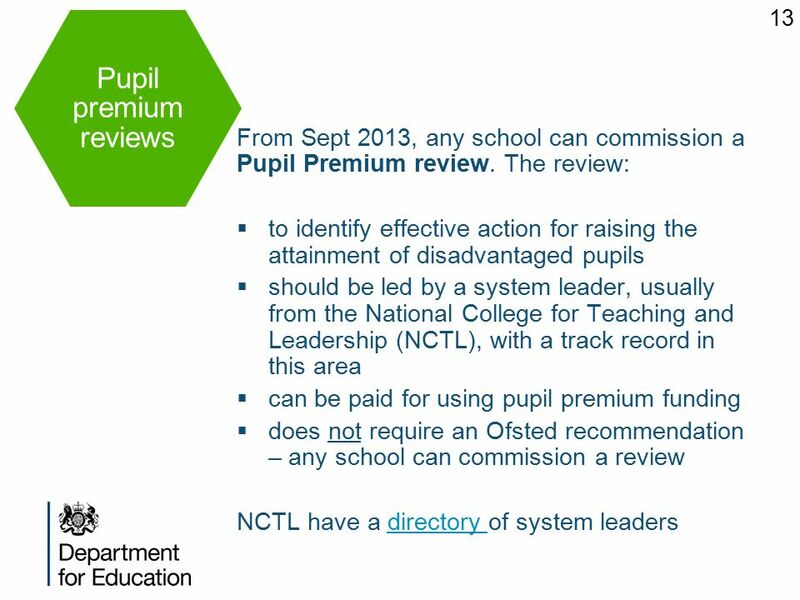 Do we have our Pupil Premium statement online? 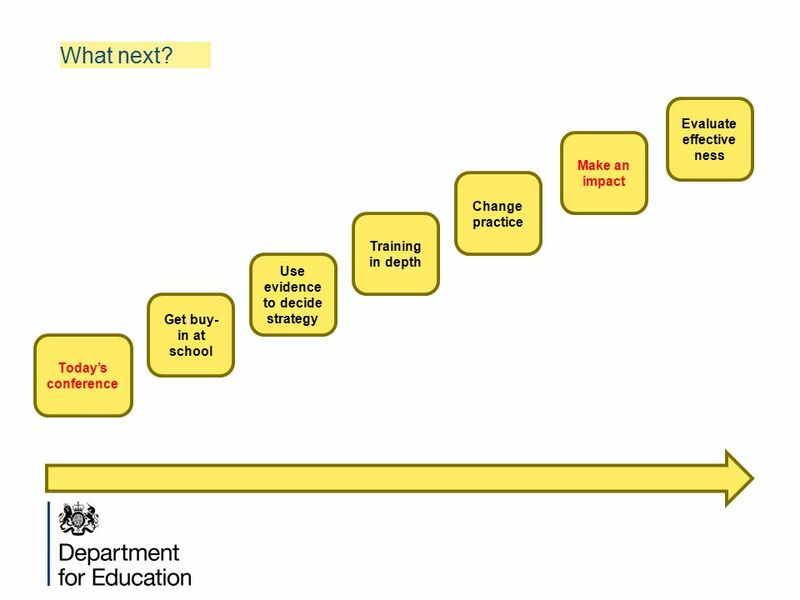 25 Today’s conference Get buy- in at school Use evidence to decide strategy Training in depth Change practice Make an impact Evaluate effective ness What next? 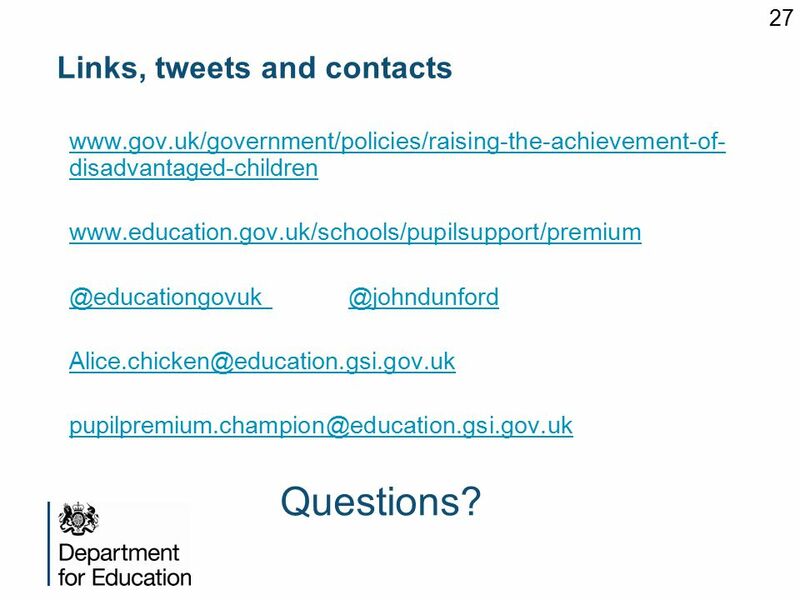 27 27 Links, tweets and contacts www.gov.uk/government/policies/raising-the-achievement-of- disadvantaged-children www.education.gov.uk/schools/pupilsupport/premium @educationgovuk @johndunford Alice.chicken@education.gsi.gov.uk pupilpremium.champion@education.gsi.gov.uk Questions? 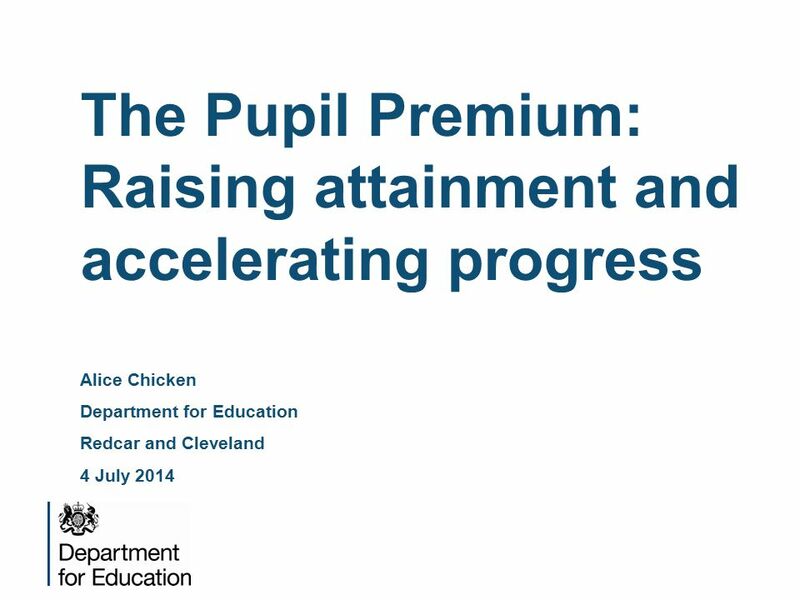 Download ppt "The Pupil Premium: Raising attainment and accelerating progress Alice Chicken Department for Education Redcar and Cleveland 4 July 2014." Dorset Leadership Conference, 2013 Using evidence to inform your leadership approach and support school improvement James Richardson 5 th November 2013. 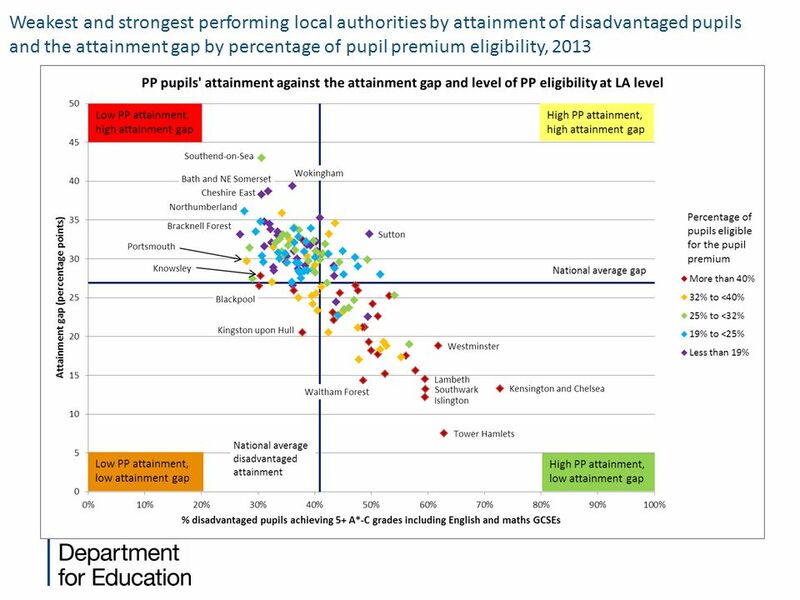 Using the Pupil Premium to narrow the gap: policy and practice Ensuring the best educational opportunities are available for all Cheshire East conference. Specialist leaders of education Briefing session for potential applicants 2013. 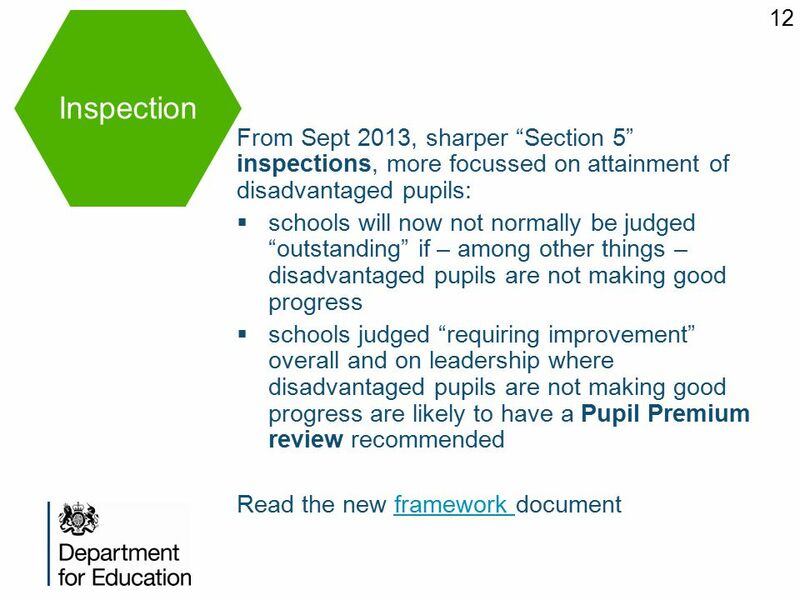 Deprivation and the Pupil Premium - what you need to know. After prior attainment, poverty is the strongest predictor of a child’s future life-chances. Exploring Research-Led Approaches to Increasing Pupil Learning Steve Higgins School of Education, Durham University Addressing. Using the Pupil Premium to narrow the gap: policy and practice Hampshire 31 January 2014 John Dunford National Pupil Premium Champion 1. The big challenge for our generation of school leaders: using the pupil premium to narrow the gap Raising aspirations, raising achievement Redbridge heads. 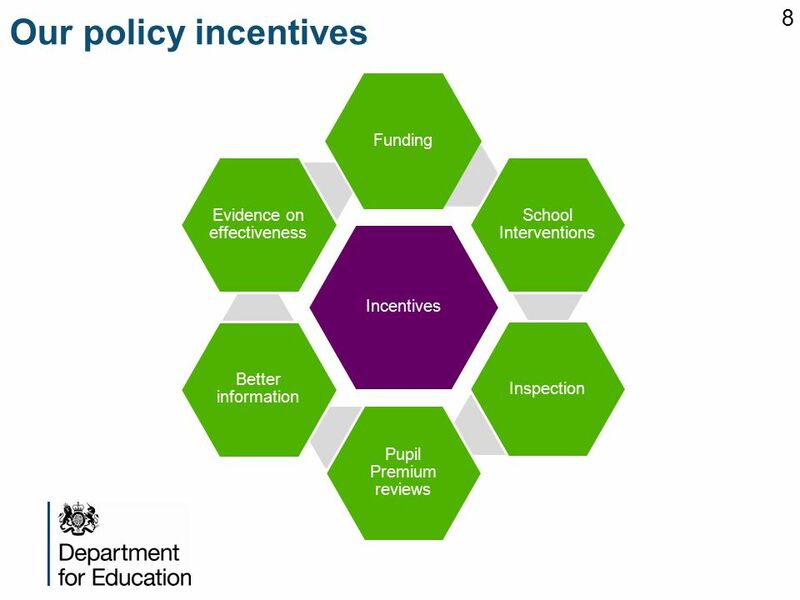 Next Steps  CE Partnership Options to take forward  Spending the Pupil Premium  Latest developments and reports from Ofsted  The recent DfE perspective. 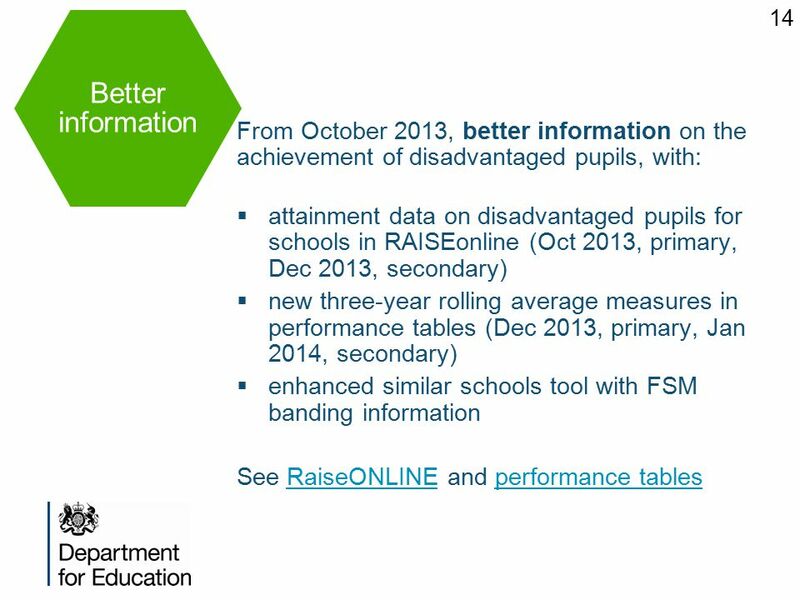 Closing the gap: using the pupil premium to raise the achievement of disadvantaged pupils LT4 ROOM. 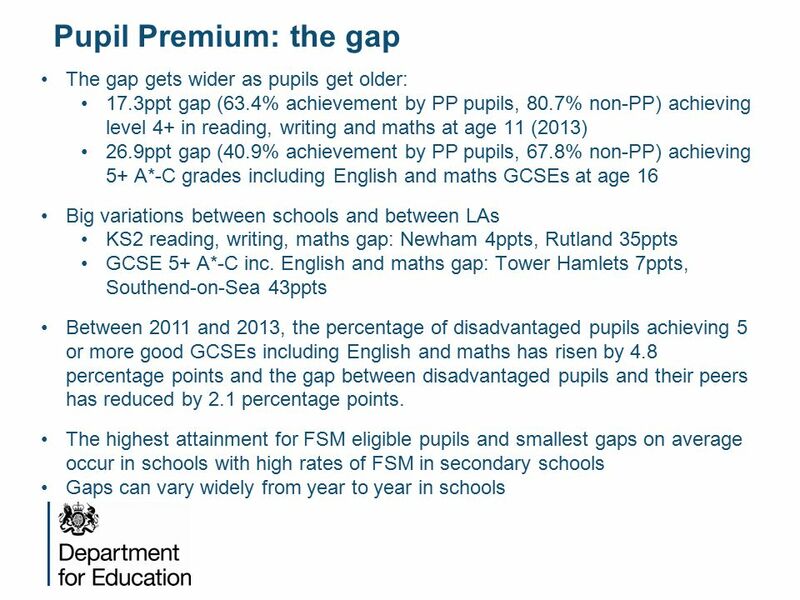 Southend-on-Sea Pupil Premium Network March 2015. 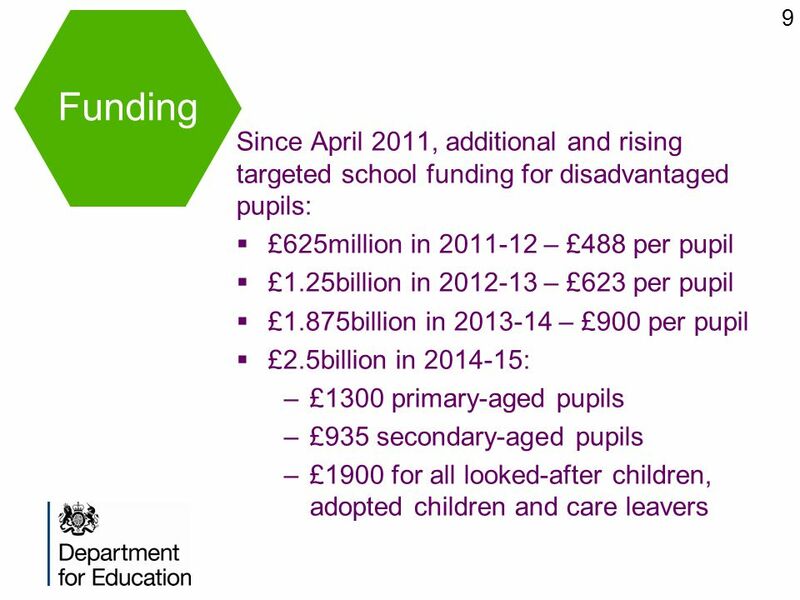 Philippa Wilding and Pat Webb How to demonstrate the impact of pupil premium funding with SIMS. The big challenge for our generation of school leaders: using the pupil premium to narrow the gap Exchanging Excellence Closing Gaps conference Hertfordshire. Using evidence to raise the attainment of children facing disadvantage James Richardson Senior Analyst, Education Endowment Foundation 1 st April 2014. 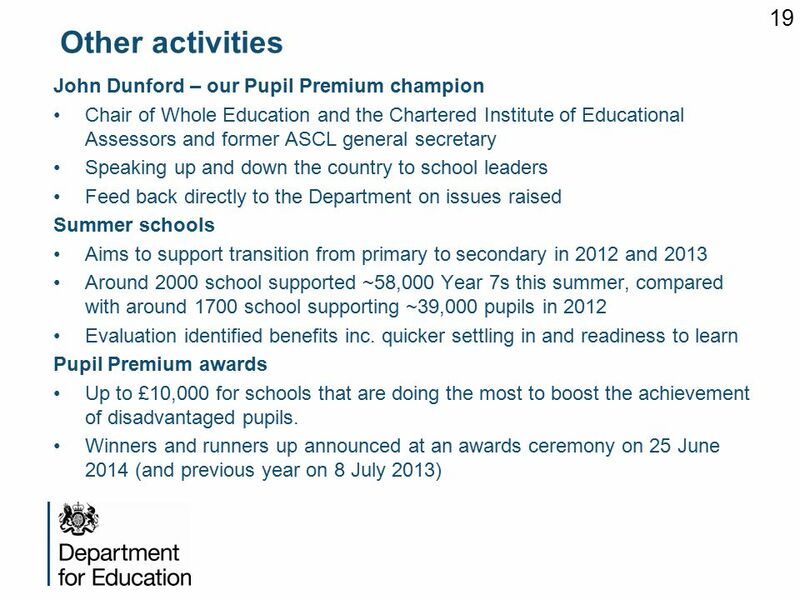 Using the pupil premium effectively to make a difference Cambridgeshire annual governors’ conference 7 March 2015 John Dunford National Pupil Premium Champion. NATT+ ‘Leading The Way’ Conference Leeds 2011 DfE Gypsy, Roma and Traveller Policy Update: Andrea Smith.